Some of our talented athletes have been chosen to participate in the Talented Athlete Sponsorship Scheme (TASS) in partnership with Teesside University, having been identified as showing potential in Olympic sports. Over the next year, 10 pupils from Years 8 to 11, who are eligible to represent England and perform at the top of the Sport England Talent Pathway, will attend six workshops at the University, focusing on lifestyle, practical nutrition, maintaining a healthy body, goal setting and mental preparation and athlete development, strengthening and conditioning. Speaking about the Scheme, Joshua Scott who plays for Hartlepool United Academy and has played for the ISA National Football Team, as well as participating in swimming, athletics and cross country, said: “I’m really grateful to have been chosen to receive this opportunity and the support which will come from being on the TASS. Recognised as one of the region’s highest performing independent schools, Red House is one of only three schools in the UK whose pupils have been chosen for the TASS. 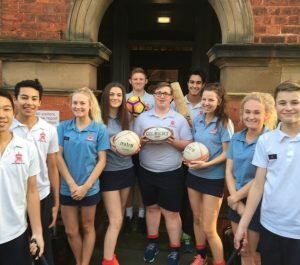 Priding itself on providing pupils with an all-round education, sport plays an important role in life at Red House, with staff strongly believing it is highly beneficial to the physical and emotional well-being of all pupils. ‘We’re delighted the talent of our pupils has been recognised on a national level and believe they will benefit greatly from the additional support they will receive from being on the TASS,” said headmaster of the school, Ken James. Red Houses’ commitment to offering a first class, holistic education was highlighted last year with the investment of a multipurpose sports facility, which came following the well-received decision to remain on the current Norton site. This state-of-the art facility, officially opened by international hockey player and former pupil, John Harris, will be on show later this month during the school’s open morning for prospective parents.